“There it is,” pointed the naturalist Chandika Jayaratne. I sat up in my seat in the jeep. “I see it!” But perhaps the words never even left my mouth. Against a milky dawn horizon, atop a boulder, I saw a leopard’s silhouette. Indolently, with the muscular majesty of a formidable predator, it pawed at something — a side of meat, or as if dislodging grit. 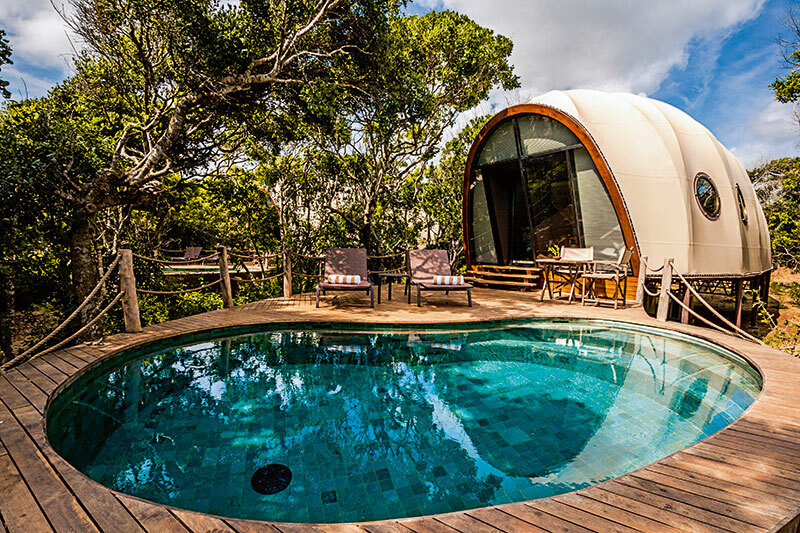 We were in Sri Lanka’s Yala National Park, on the peripheries of its newest and most dazzling resort, Wild Coast Tented Lodge. “This might be the leopard that growled at me the other night” — Jayaratne had mentioned this encounter to me the previous day. And the resort manager had also cautioned of leopards near the camp. Camp, of course, was a misnomer for this world-class hotel — comprising handsome cream cubes of top-notch luxury — bookended by the forest on one side and the ocean on the other. Presently, the jeep restarted and we set out for the jungle, leaving the leopard, likely a young female, to rest; already, our safari had begun auspiciously. Our second leopard sighting was not as intense — an older male nestled in the branches of a tree. 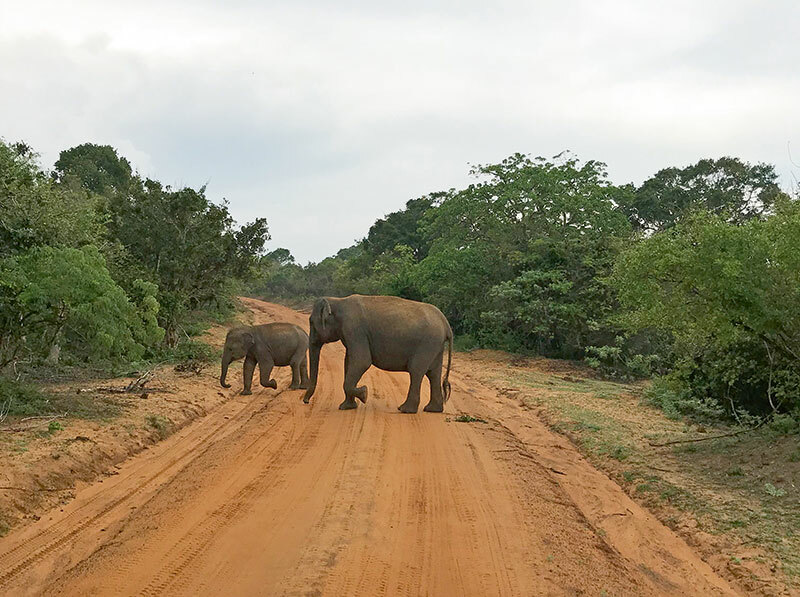 But while we were stuck in a line of jeeps, clamouring for a view, we had a Yala moment: an elephant and her stripling marched behind our jeep, a few feet away, exasperated by our presence. My heart skipped a beat when she raised her trunk. I drew in a gulp of cold air and looked out at the landscape, its time-paused quality, with remnants of early civilisations, including Situlpahuwa and Akasa Chaitiya. Yonder, tremendous rocks rose, including Elephant Rock, which recalls the silhouette of the giant pachyderm. I felt as if I was in the cradle of ancient time. Wild Coast Tented Lodge is a miracle of geography — a bleached sandy beach is at its stern — water-smoothened boulders, ocean whipping up a white shore. Pug marks on the shore and the lurching breeze reminded me that under this tremendous, daunting, uncharted beauty ran the full might of nature’s unpredictable turbulence. In Sonali Deraniyagala’s book Wave, she charts a family break at Yala, where a freak tsunami took her husband and children, leaving her as sole survivor of a family. Perhaps novelist and poet Rainer Maria Rilke was right: all beauty is only a terror we can yet endure. At Yala, I bumped into my buddy Malik Fernando, founder of Resplendent Ceylon, where at lunch he regaled me with stories of visits here as a child. “We came twice a year, about a dozen of us; it was a major expedition then. We’d go to a particular baker in Colombo to get jungle bread that wouldn’t go off quickly and stock up on absolutely everything, including, as I recall, water!” His wife’s family — they were childhood friends then — went one step further and got a cow trucked, for fresh, familiar-tasting milk. Fernando has the cool, caddish appeal of someone with a very good golf game, and his extraordinary dispensation — his family owns tea giant Dilmah — did not dissuade an entrepreneurial streak as he segued into the hotel business. More importantly, learning from his father, Merrill, who set up the MJF Charitable Foundation, Malik is hands on with the foundation, driving the leopard conservation station next to Wild Coast Tented Lodge, which will have facilities for five researchers, and will build a body of research systematically to help protect this keystone species. “We don’t just write cheques, but actually manage all our programmes to ensure effective outcomes,” he told me, outlining an honourable host of philanthropic ventures. Prior to Yala, I’d been to Malik’s other baby, a stunning renovation of bungalows in his tea estates. Nowhere is life’s excellence, its fullness, its force and its music, its mystery, its damage and radiance more apparent than in Sri Lanka. On my way to the tea estates, I stopped to look at the abundant, eddying churn of brown water of the Kotmale River. Tall trees rose from flanking hills, with a mien and carriage of warriors: majestic, proud, as if drawing sustenance from some impregnable, imperceptible life force. A pinhead wisp skid on a broad green leaf in balletic movements. I saw a poinsettia in bloom — its red so authentic, so daring one might never encounter this colour again. 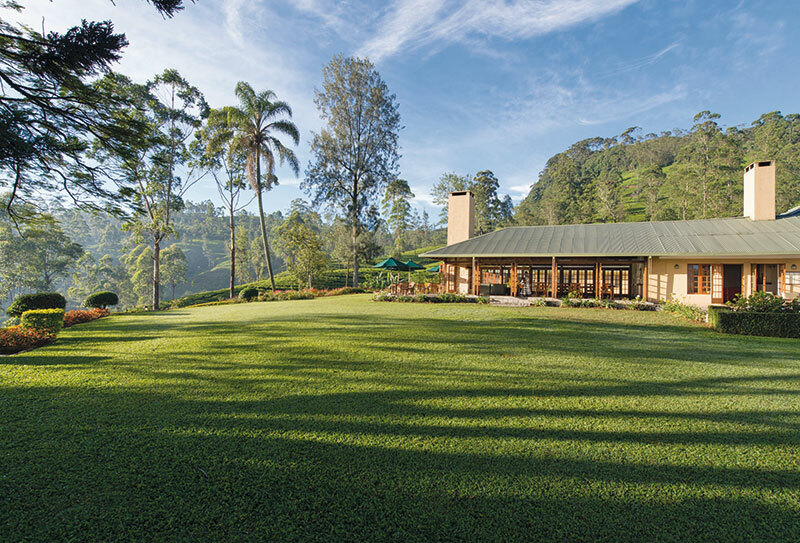 I was staying at the Dunkeld cottage, part of Ceylon Tea Trails, my room overlooking the valley with a lake in its centre. I’d spent two days — and my most exquisite gift had been the sleep I experienced…come here to restore the spirit and to recognise that life’s essential character is solitary. Such splendour and peace is also an aspic for greatness, or madness, an idea brought to life in Michael Ondaatje’s transfixing memoir, Running in the Family, a necklace of black pearl anecdotes. Growing up on the tea estate of Kuttapitiya, Ondaatje’s mother was a local Isadora Duncan figure; Ondaatje grew up with soirees by the lake, as marriages fell apart and alcoholics flourished — a rich world veined with tragedy. I told Malik I’d go back to his tea estates, but I’d stay for longer, to write. “We’re close, huh?” I asked Pierre Pringiers, businessman and founder of Sail Lanka. Our boat stopped deferentially metres away from a whale in the Mirissa Bay. “Yes,” he replied. “Quite close!” We were on one of Pierre’s prize boats — a labour of love and passion, made with excellence in Sri Lanka for the world. 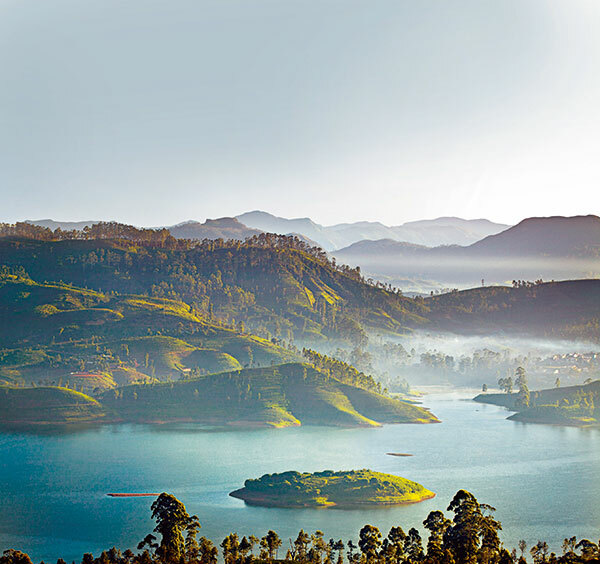 ‘An enormous sky meets an enormous sea….’ — Leonard Woolf wrote about Sri Lanka in a letter — which is most apparent miles from land. “Tail, tail, tail,” is the cheerful chorus from our boat’s captain and his team, hoping that the dazzling mammal will indulge in a spot of pectoral slapping which it does, making our expedition dramatic and memorable. The grey water, whipped by an oncoming monsoon, had theatrical presence, like an Amar Kanwar video. I know Pierre as I am a fan, and friend, of his wife, the artist Saskia Pintelon — her work is nocturnal and witty, meditative and disturbing, drawing on decades of magical time spent in Sri Lanka and a stark European formalism, which combine to imbue the canvas with precision and elegance. As tribute to her lacerating, singular genius, Pringiers commissioned Japanese architect Tadao Ando to make a home for them, with an enormous artist’s studio at its heart. The house, a masterpiece of minimalism with architectural lines sublimating into landscape, is where we had had dinner the previous night (the couple, in Vantablack attire that paid homage to Yamamoto and Miyake, are easily one of Asia’s most fashionable duos). Pintelon unleashed such extraordinary, Arabic-infused dance music, served so fluently by Ando’s space, one could only spin, as if a dervish lost in appreciation of time and its mysteries. My dancing must have been a tad outrageous for Pierre, a towering, handsome embodiment of dignity and restraint; yet, he was utterly forgiving on the boat, where sea sickness betrayed me as a bore who shied from the yacht’s sterling lunch. Pringiers has led a renaissance of sustainable ecological tourism in Sri Lanka, particularly around the spectacular belt of Cape Weligama, where Sail Lanka’s boats take visitors out to discreetly and respectfully study marine life. Following in his footsteps, dozens of local boats ferry tourists several miles to look at sperm and killer whales, pods of dolphins — some resident, others migratory. Pringiers — a Belgian tycoon with the dazzling taste of a dandy and the gravity of a visionary — came to make the boats in a local shipyard on a lark, after he had handed over the reins of his main business to his son, Koenraad. Now in his seventies, an avid sailor, with vessels in Sri Lanka and Europe, he is committed to helping the local economy after the tsunami — and tourism. Whale watching, once restricted to marine biologists, is now a way for local families to earn a living. Pringiers capitalised on this idea, and refined it — today, some of his bigger boats, with rooms, are popular for short trips — a weekend out to the coral island of Delft, with its wild, miniature horses. “I am confident that travel by boat between Sri Lanka and India will be common soon — the half-day ride will be a joy for the scenery alone.” His not-for-profit foundation supports villages that were destroyed by the tsunami, making locals self-sufficient by relying on tourism-related activities such as leisure boating. “We also rebuilt over 750 houses after the tsunami,” he tells me, which explains his heroic status in Sri Lanka. I was flying back from Colombo, one of my favourite Asian capitals. I’d stayed at Maniumpathy — a gorgeous manor house restored thoughtfully by a British man, evoking a Colombo of yore, all white colonnades, ‘gossip corners’, and ancestral silver. The monsoon evening articulated over by the courtyard. Pricked with rain, the pool caught moonlight in ballast. As I left this lovely property, I took the key of my room. Maniumpathy’s elegant staff called me about my error, and I promised to send it back, although I later wondered why I had brought the key along with me.